I'll put in my plug for voting NO on the preschool/childcare props one more time. This plea is for Seattle Schools parents. In every single document that I have found about the preschool plan, the number one "priority" is to "partner with Seattle Schools." After you have read thru a number of documents, it starts to jump out at you. Now 1B says, we know there is little space and there's other things we'd like to work on with SPS. Yes, SPS could help with curriculum, info on how they already work with preschool groups, etc. Except that, as the Board complained at the recent Work Session with Councilman Burgess and others on the preschool plan, the district really hasn't been consulted on curriculum. The Board wasn't invited to give any input at all on the preschool plan. Hmm. I tell people I know that if 1B passes, the full-court press is coming to the district from the City and it will be from multiple angles. In fact, my cynical side thinks that the district may be getting that full-court press in the form of a stick and not a carrot by which I mean if the district doesn't help with space, maybe the district might not get things it wants in the way of grant funding, etc. Why do I think the pressure will be huge? Two reasons. Looking at the Seattle Weekly, I was taken aback from the official photo of the former principal (for now) at the Center School. Wishing all your little goblins and witches a Happy Halloween! Tomorrow is Day of the Dead, a Mexican holiday. Seattle Center has weekend of activities. I am a kindergarten teacher in a school where the vast majority of students live below the poverty line. My Head Start pre-K graduates not only have pre-academic skills, but, more importantly, understand how to listen to a story as a member of a group, how to solve interpersonal problems (i.e., how to take turns with a special object), have greater mathematical understanding, and have a far greater vocabulary in both their birth languages and English. I have NEVER questioned the value of Pre-K. Frankly it's a luxury to be able to do so. I don't have any idea which I'll vote for, 1A, or 1B, because I've been too busy teaching to do my research, but I'll definitely be voting for something that increases access for the families I serve, who, although working and contributing in so many ways, cannot access quality early childhood education for their children. K Teacher, there is no doubt that children who come to kindergarten from a high-quality preschool are better prepared for kindergarten. That is not up for debate. The issue that I raised is that that preparation fades by 3rd or 4th grade, hence the "fadeout." I agree with Lynn that the point of providing subsidized preschool for low-income children is not to better prepare them for kindergarten per se but to better prepare them for lifelong learning. And there's no evidence that participation in high-quality preschool has any effect whatsoever on long-term outcomes for the participants. I think we would all be better served if we provided health care, dental care, and nutrition for low-income children and job-training and parental support for their parents. As Lynn wisely points out, we need to address the causes and effects of poverty. Preschool is no silver bullet despite how much advocates infer that it is. Poverty, my friends, is the issue. We can have 6-hour "academic days"for preschoolers (that would be 1B). Add in (at some point) wrap-around services. But it will NOT solve the problem. Some help might be better than none, for sure. But then again, help from birth to five might be better than none (that would be 1A). Which is better? Which will serve more low-income tots? Who knows? The answer is... no one. But we need to stop thinking it's about "education" and not about society. Summary: it appears that most of the Board, both as a group and individually, have real issues with the Alliance. It is not to the point where they don't want to work with them but the issues are both irritants and concerns. It would appear that the many on the Board believe that the Alliance oversteps its grounds (in relation to its work with the district) and the Alliance's insistence on being a "critical friend" may just be too much for the Board. More support, less criticism and attempts to steer direction for the Board. In a frank discussion at the Work Session on Tuesday, much was heard and learned about what the next MOU with the Alliance might look like. I am left to wonder - if the Board and the Alliance have a hard time figuring out where to meet and how to talk - will there be an MOU? Because with the Alliance's increasing strong stands on what needs to get done in the district and the Board wanting to set the goals (and the Alliance can follow or not as they want to), maybe the Alliance will not sign an MOU they don't like. Then, they might then just be another moneyed ed advocacy group. I apparently have an issue on my computer. I'm going to attempt to fix it but the e-mails says something like I have a Googledoc. Halloween reminder: Toy weapons or anything that resembles a toy weapon are not allowed in Seattle Schools. Students must be identifiable in their costumes, so no full masks allowed. Costumes shouldn't get in the way of school activities, including P.E. and recess. Each school has the discretion of making additional rules around Halloween costumes and activities. Check with your school for further information. One artist dad's idea of fun with his daughter (apparently she thought so as well). Note: creepy photos with small child. Not for small children. Update: Shelter in place has been lifted from these schools. Shelter in place: Eckstein,View Ridge, Bryant,Thornton Creek after bank robbery,73rd/35th Ave NE. No students involved. Yesterday staff presented an update to the Board during a Work Session on the Strategic Plan. I did not attended but just read thru the presentation. It includes survey results of both parents and staff. At this stage, we are highlighting data but do not yet have root cause analyses or proposed solutions. Here's the story from KIRO-tv . (They get one thing wrong - the Aki student killed, Anahlia Cowherd, was not a "fifth grader" at Aki because it's a middle school. I have been unable to reach Communications but it was reported she was 11 so I would think a 6th grader). On the Center School incident, one odd thing that I noticed yesterday when I received a press update: the principal has been replaced. Update: Story from The Capitol Record and link to oral arguments. From the brilliant and hard-working Meg Diaz, data on enrollment for about the last 15 years. The District has posted an updated draft of the proposed Advanced Learning Policy and Procedure. The updated versions still contain the flaws of the previous drafts. Google's doodle today is the hundred birthday of Jonas Salk who invented the polio vaccine. The annual lesbian, gay, bisexual, and transgender (LGBT) Families Dinner will be held 6 to 8 p.m., Thursday, Nov. 13 at Nova/SBOC (old Meany Middle School). District leaders and members of the School Board will be there to welcome LGBT families and their friends. All District families and staff are welcome to attend. Dinner is complimentary, and there will be craft tables for younger attendees. For more information and to reserve your spot at this popular event, click here. I put up another update on the Center School incident yesterday. It sounds like both staff and students did a great job in handling the situation. Fun fact: there are now only about 20+ schools where parents pay for kindergarten. The district has managed, through LAP dollars and other funding, to fill in that half-day that the state doesn't pay for. McCleary can't come fast enough. I also note that the district has financial documents, like Race to the Top, that reference "in-kind" staff time "donations." Keep this in mind around initiatives like RttT and preschool. 1B likes to say that SPS doesn't have to give space but I'm certain that any partnership will include a lot of staff time from several departments. In-kind donations of staff time, whether dollars exchange hands or not, are REAL money. A reader had mentioned this previously but here's a list from OSPI of school bus violations statewide by drivers in cars. Number of vehicles that passed buses: 371. Most were in the morning (190) with afternoon close behind (166). There were 206 that passed from the rear and 165 from the front. Most passed on the left but at least 14 passed on the right. The Board Work Session about the MOU with the Alliance for Education is today and yet there is no presentation posted. No way for parents or the public to know what it is or to weigh in. I will note that the Alliance not only covers its costs by handling PTA funds for some schools, they make a profit on it. If they are making money, then that activity should go out to bid. SPS needs to make sure they are getting the best possible deal for this work (and it seems unethical to not allow other groups/companies access to this work). The proposed field trip last Friday to Vashon Island, an eight-year annual tradition by the Garfield jazz vocal group (about 70 students), had been pulled at what seemed like the last second. This confusion happened because despite the approval of the principal and the district's risk manager, approval was not given by the Executive Director, Sarah Pritchett. They had only two weeks from the time that the ban on field trips at Garfield had been lifted and felt they had all the necessary documentation done. The Vocal Music supporters sent a letter to Ms. Pritchett and Mr. Tolley to ask what happened. They are really upset because there are potential costs of $10K from breach of "various contracts." They maintain they repeatedly called Ms. Pritchett on Friday to get an explanation and she could not be reached. They want the district to help mitigate those potential costs. "..submitting field trip paperwork at 3:15 PM when the trip is scheduled to depart at 4:30 that same day does not allow a reasonable opportunity for review." He said he told Principal Howard this. He also said it would need Ms. Pritchett's okay. He said he didn't believe the district was responsible for any costs. There is no explanation as to why Ms. Pritchett was unavailable to explain this on Friday. Update: well, will you look at that? 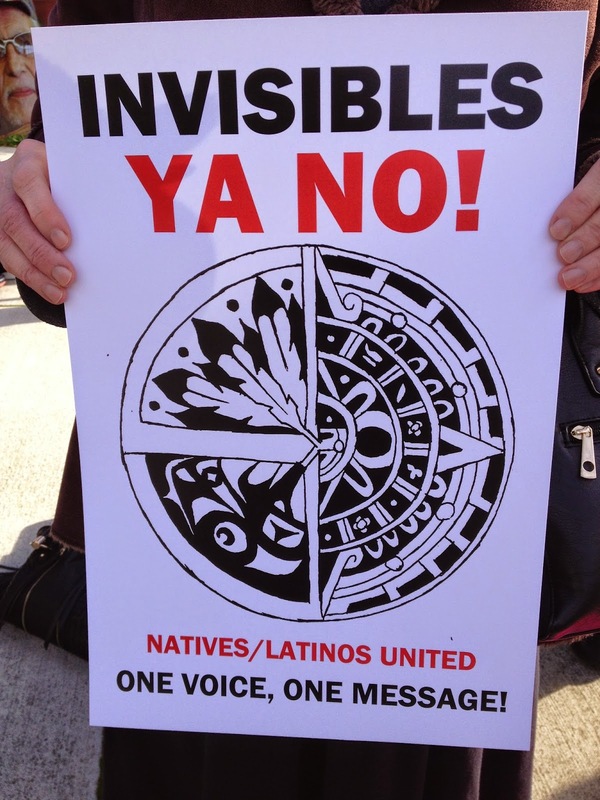 On the same day, Publicola and The Stranger choose to highlight one campaign issue. And it's their support for 1B. Hmmm. After several forums (most of which I was invited to), I've learned a lot about the two campaigns for childcare/preschool, 1A and 1B. That will get the City Council and the unions back to the table to deliver one early learning proposition they both agree on. I attended this protest rally in front of Ingraham High today at noon. There were about 40 students and community members. Sponsored by the Native/Latino club at Ingraham High, it was organized to call attention to issues around cultural competency, equity and student learning. One student read Ingraham's mission statement which says, in part, "to empower multi-ethnic urban youth.."
The school went into Shelter in Place and then the school was evacuated by SPD (as in a fire drill procedure) and attendance was taken outside. The rest of the building got emptied by SFD. The students got cold and were moved to a pavilion to stay warm. The students are to have a "debrief" this morning. SPS Communications tweeted that The Center School was evacuated this morning around 9:30 am after a student brought a Molotov cocktail to school. There are no injuries and SPD and SFD are investigating. Students were sent home for the day. It was announced last night that another Marysville-Pilchuck High School student, Gia Soriano, died last night. She was 14 years old. I note that there are still three other students in the hospital in serious condition. The Times reported that the two boys were cousins of the shooter (who killed himself). The school is closed this week to allow for some of the initial shock to wear off. One student said he could not go back in the cafeteria. I think it might be wise for the school to repaint and reconfigure the room so that students don't get that shock from walking into the room. I'm sure the school staff will do what they can to help mitigate those feelings for students. It also helps not to leave guns where a troubled teen can access them, either to hurt themselves or others. 1B will give all enrolled their first chance to be part of a very large state/federal database of public school students. Know a Classroom that Could Use These? A neighbor of mine sent this; know of a classroom that might be able to use it? some other miscellaneous equipment from our many years of raising fish and hermit crabs etc. The Times has a fairly in-depth story about the Beacon Hill cheating incident. In most cases, it appears someone changed answers from wrong to right on the 20 to 25 multiple-choice questions that make up part of the reading and math exams. But on question No. 3 of the third-grade reading section, the pattern was just the reverse. Four of every five responses on that item were erased and changed to the wrong answer — a bizarre blip in what otherwise looked like an across-the-board attempt to help students get more answers right. Very odd. Did someone get tired? Mixed-up? One way to quiet a classroom from a teacher in Belgium . Finally. The Court will hear arguments from both sides. Seemingly no urgency here despite the state of Special Ed services in SPS. It will be interesting to see what this "marketing campaign" for more diversity on SEAAC will look like. It looks like a bit lift to find that many people from such a variety of groups. That this will now run until the end of November likely means nothing will happen until after the winter holidays. Nothing like deliberate speed. We want to thank you for your application to serve on the Special Education Advisory and Advocacy Council. We are looking forward to a productive year working with the Council to address the five goals for Special Education in the Seattle Public Schools Strategic Plan. There was no explanation given and, despite Principal Howard's best efforts to contact anyone at JSCEE yesterday afternoon, he couldn't get ahold of anyone. There were to be 70 kids on this trip. Some of the kids think it might be retaliation for the rally on Wednesday. If the district has a problem with a field trip, they need to make that clear BEFORE planning is done, chaperones gathered and money paid. Oak Harbor announced early Friday evening that it would take second place in the Wesco 3A North division (football), giving up the league title to Marysville-Pilchuck following the fatal events that took place at Pilchuck earlier in the day. Oak Harbor's football team ALSO came to the vigil last night in Marysville. Those young men have learned a valuable lesson about compassion and sportsmanship. A bit of confusion all around (and you could see this from the Superintendent's letter). What process is happening? I think recounting using the Running Start students eligible to be counted. Or something else? The following is a brief statement from our Interim Superintendent Dr. Larry Nyland. He is the former Marysville School District superintendent. "My heartfelt thoughts are with the families, students, staff and entire Marysville community during this difficult time." What a terrible day for him. I'm sure he must know many staff members at the school. It is a struggle for adults and children alike to try to comprehend why and how such a senseless and shocking incident could occur. Excessive and repeated media viewing can create increased anxiety, and therefore limiting ongoing exposure is recommended. Additionally, talking about the incident can be a healthy way for families to process their feelings and reactions to an event of this nature. Stick to facts. Answer questions factually. Remain calm and reassuring. Students take their cues from their parents and adults. Be a good listener and observer. Pay attention to changes in behavior. Notice when children have questions and want to talk. Be especially loving and supportive; children and teens need you even more at this time. Take care of yourself. You are better able to help your students if you are coping well. If you are anxious or upset, children are more likely to be so as well. Today is a tragic day. Our thoughts and hearts go out to the students, staff and families at Marysville Pilchuck High School and the entire Marysville community. In November 2013, the Seattle School Board approved various changes to elementary and middle school attendance area boundaries (Growth Boundaries). These changes are being made over time. Planning is now underway for the boundary changes proposed for implemented for the 2015-16 school year. Students will be grandfathered at their current school. In September, letters, including translated versions, were mailed to the families living in the affected areas who currently have students enrolled in Seattle Public Schools. The letters invited families to come to community meetings in early October to learn more. Enrollment projections show that these changes affect up to 1,172 current students. A second round of community meetings are being held in upcoming weeks to answer questions and receive additional community feedback. The schedule is below. Update: the shooter has been reported as committing suicide. He was a freshman and played football. He had been voted freshman homecoming king. He was very close to his family and involved within his community. Some are saying it was over a girl who had rejected him. It is reported that many students either ran from the scene in the cafeteria or ducked under tables when the shots rang out. There will be a vigil at a church in Marysville tonight. The Times is reporting a shooting this morning at 10:45 am at Marysville-Pilchuck High school in the cafeteria. Four other people were wounded, three of them are in serious condition. The school has 1200 students. Some evacuated were walked from the building with their hands up, others locked themselves in classrooms. “The board, I believe, felt they wanted to give students who are involved in those kinds of things the opportunity to take a senior picture with their hobby, with their sport, just like anybody with any other hobby or sport,” Superintendent Mark Sievering explained to local paper, the Omaha World-Herald. As for the "tasteful" requirement, that means classy poses only folks: no photos with weapons pointed at the camera, no brandishing of weapons, and no "scantily clad girls." Can't they just take a photo? In the yearbooks I was in, it was a simple head and shoulders shot. Change.org has a petition up for saving recess in Seattle Schools. Speaking of women role models, great interview with Michelle Munson, CEO of Aspera from the NY Times. What career and life advice do you give to college seniors? No. 1: competence. Nothing, nothing, nothing replaces being competent in what you’re doing, and that comes with respect for opportunity. I do not subscribe to the idea that young people should emphasize people skills. The world is not just a social network. The second thing is critical thinking, which leads to independent thinking, and that comes from a diverse education and stretching yourself with independent-study internships and outside projects and activities. Director Patu from 10 am-11:30 am at Cafe Vita. The Times (finally) had an op-ed that wasn't for mayoral takeover or promoting 1B. That was written by Seattle Schools parent, Rita Green, is even better. Rita is a savvy, smart, dedicated parent and advocate for Rainier Beach High School. My hope is that she may run for the School Board soon (before it becomes an appointed job). Her POV is that 1B likely won't help low-income students and may even hurt the situation. She supports 1A. Now I believe voters should reject both but, since you can name a favorite (or the lesser of two evils), you probably should vote. My vote, like Rita's, would be for 1A. I'll highlight her thoughts but my basic one is that, after consideration, I think more low-income children would receive the benefit of 1A and that's where I want my tax dollars going. It was pretty great. Loud and proud, about 500+ Garfield students came out and spilled down the long front steps to the school. The drumline came out. There were signs and chants "We want to graduate!" Totally student-directed and organized. The student were actively engaged and boy, it was a diverse crowd. Director Peters was there (didn't see Director Director Peters was there (no sign ofBlanford). She spoke and told the crowd that she had talked with Superintendent Nyland and encouraged him to review the numbers. She also said she agreed that the teacher should be funded out the rainy day fund. I got to the press conference late . The district was represented by a female administrator I did not recognize and Stacy Howard of Communications. They said the district is reviewing the numbers that Garfield has versus what the district believed them to have for "discrepancies." They said it was not true that a core teacher would be lost. They said that that the least senior teacher in whatever department it is would be the one to leave but no teacher would be "gone by Monday." One issue about the discrepancies may be over the Running Start count. Those students may or may not have been counted so that may be an issue. There were several tv stations and radio stations there so I expect this will be all over the local news. I'm just on my way out the door to the Garfield walk-out and this message came up on my feed. It's from Superintendent Nyland. We are still working through this process, and we would hope the community will allow us time to complete our process. What? How does that help Garfield to say a process is still going on? I'll confess that this does not have to do with Seattle schools or its students. But with the lack of concern for ANY student exhibited here, you have to wonder if this kind of lax behavior could happen anywhere. Rep. Gerry Pollet, a true friend to public education, was being interviewed by KIRO-tv about the clean-up of radioactive sewer lines near Magnuson. Look who comes walking along; students from the Waldorf High School. Watch how students are protected by a chain link fence from radioactive contamination at Magnuson Park. Numerous groups of students walked within a couple of feet of the work crew in radiation protection tyvek suits as they dredge out radioactive contamination from a sewer line. Their protection against splashes and contamination is the chain link fence. Students in this video are walking from NOAA road underpass towards Waldorf High School and Building 27 (indoor soccer). We have asked WA Departments of Health and Ecology to take some common sense safety regulatory steps since they told the public at Tuesday night's public meeting that they are overseeing safety of the cleanup by the Navy. Ingraham High School has a Native/Latino club. Since both the district and the City had passed resolutions recognizing Indigenous Peoples Day every 2nd Monday in October and, since November is Latino Heritage Month/Native American Heritage month, the club had asked the school for a school-wide assembly to "promote and celebrate" these recognitions. But the school leadership said no. According to a press release, "Ingraham H.S. has no formal policy or procedure for student club initiated school-wide assembly requests." The students do have a grant to raise awareness of Native American students and wanted to use some of those funds for the assembly "to engage the Ingraham community by educating staff and students about local and National leaders, artists, activist and providing a rare look into Native/Latino perspectives, experiences and contributions." The students are not happy with the no coming from the office. These Ingraham students plan a noon protest on Monday, October 27th by the flagpole near the main entrance to stand in protest in solidarity. The personal information of almost 100,000 people seeking their high school transcripts was recently exposed on a Web site that helps students obtain their records. The site, NeedMyTranscript.com, facilitates requests from all 50 states and covers more than 18,000 high schools around the country, according to its Web site and company chief executive officer. The data included names, addresses, e-mail addresses, phone numbers, dates of birth, mothers' maiden names and the last four digits of the users' Social Security numbers. Although there is no evidence the data were stolen, privacy advocates say the availability of such basic personal information heightens the risk of identity theft. The availability of the data appears to be the result of a flaw in the way the two-year-old site was designed. It highlights how easily sensitive personal information can be exposed with the proliferation of online businesses and services - many of which do not employ adequate security practices. 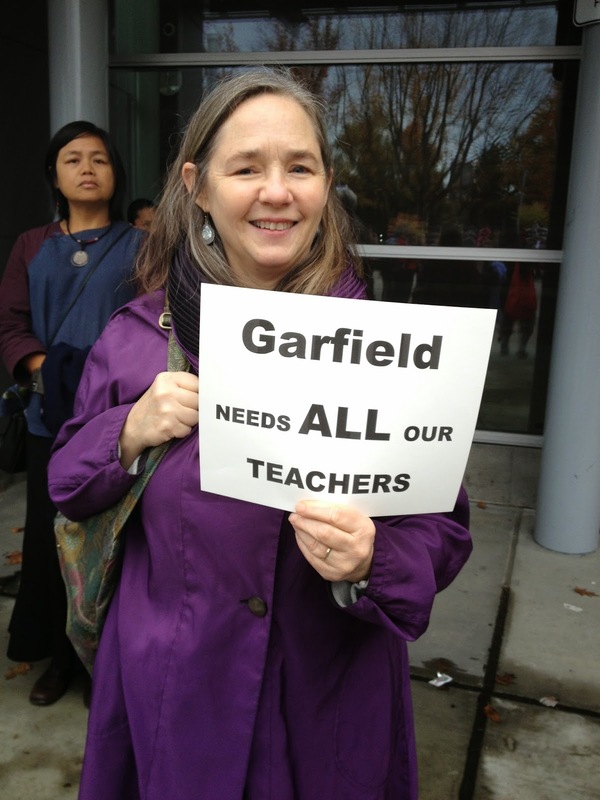 The Seattle School District has announced its intention to withdraw one full-time teacher from Garfield, effective Monday, October 25, 2014-leaving 150 students without a class for the rest of the semester, unless Garfield produces $92,000 by Friday, October 24. This cut will occur despite the fact that SPS holds $8.5 million in reserves that could be used to cover this expense. Garfield High School is already the lowest funded High School in Seattle. At $5,951 per student, we are a full 15% below the average of $7,004 per student per the 2014/2015 district funding report (page 44). There will be no replacement-the cancelled classes will simply cease to exist and the affected students will finish the semester with a hole in their schedules. The cut will occur in core education (math, science, language arts, history, world languages or arts) and there are no provisions for making up required credits. It hasn't been determined yet where the cut will be made. It could affect any student in the school, in any grade, and on any academic path. The teacher will be reassigned to another school, but the 150 Garfield students will be left without a class for the rest of the semester and the rest of the student body and teaching staff will be greatly impacted. 1. Send emails to the District leadership and School Board right away. Let them know the sudden cancellation of classes for 150 students is unacceptable--and you don't want our kids wandering the school halls for an hour a day while unable to finish a class they have now been in for 9 weeks. Urge them to find a solution that doesn't sacrifice our students and their education. Demand they fix this broken process that threatens buildings annually. Our kids deserve a better method for reconciling enrollment projections. 2. Show your support by being part of an all-school "walk-out" protest at Garfield on Thursday, October 23, 1:50 PM, just before the end of the school day. Join students, staff and other GHS families-make your voice heard! Thank you for your support. Please contact us with any questions or concerns. - "...COPPA has become yet another hurdle between teachers and connecting students to digital learning opportunities. " (FYI, COPPA stands for Children's Online Privacy Protection and it's part of the FTC. - "Can teachers provide consent for students to register for online websites? " -"May students who are under thirteen years old even use Web 2.0 resources without running afoul of the law?" I believe there should be a parents bill of rights on student data and one of them should be that, at the beginning of every school year, they get a list of any and all online resources their teachers/principals might access for them. You should at least know what your child may be signing up for. I'm just not getting how/why parents are losing the ability to know what their children are doing online while at school. Guess What I Would "Ask the Mayor?" You ask, the mayor answers during a live broadcast of Ask the Mayor, 7 p.m., Wednesday, Oct. 22, from Seattle City Hall, 600 Fourth Ave. Ask the Mayor’s format features a live audience and a topic of focus during the second half of the hour-long program. During the first half of the show, Mayor Ed Murray will join host Brian Callanan to discuss a range of city issues. Murray will answer questions posed by a live audience as well as viewer inquiries submitted via e-mail and social media. In the second half of the program, Callanan and Mayor Murray will discuss his 2015-2016 budget proposal. Mayor Murray submitted a 2015-2016 budget that expands funding for priorities in education, worker protections, public safety and support for the homeless. The mayor is also proposing to bring new transparency to the city budget, including increased accountability for program outcomes and improved access to information on city finances. The City Council has begun their review of the mayor’s proposal and is currently receiving public feedback. Joining the mayor will be Ben Noble, director of the City Budget Office. This is your chance to talk to the Mayor about the budget and share your priorities for the upcoming budget. There is no cost to attend the live Ask the Mayor broadcast, however seating is limited and advance registration is encouraged. Register online at www.askthemayorseattle.eventbrite.com or call (206) 684-8821. Doors open at 6 p.m. with audience instructions at 6:45 p.m. The live show is from 7 to 8 p.m.
Can’t join the conversation in person? Watch live on Seattle Channel cable 21 or online at www.seattlechannel.org. To submit questions in advance or during the live broadcast, e-mail askthemayor@seattle.gov, tweet @SeattleChannel using the hashtag #AskTheMayor or comment on Facebook at www.facebook.com/SeattleChannel. Will Your School be Missing a Teacher Soon? Seattle Schools and Field Trips: What the Heck?